I have friends who are vegetarians and others who are on a gluten free diet. Of course, I had to make a soup for them! From my experience, vegetarian soups are often a thin vegetable broth with a few vegetables floating around in it. I couldn’t see any reason it couldn’t be rich, hearty and full of flavour. 1/2 onion cut into chunks (no need to peel it). I just covered them with water and cooked on low for 18 hours. I strained the broth off the vegetables and discarded the vegetables. I find that sautéing mushrooms and onions gives a nice meaty flavour so I heated 15 ml (1 tablespoon) of oil and sautéed 1/2 of a large onion, diced for about 5 minutes, just until getting a bit of colour. Then I added 500 ml (2 cups) of chopped mushrooms. I sautéed for another 3 or 4 minutes until a nice golden fond formed on the bottom of the pot. I brought it to a boil and reduce to simmer. I cooked until the rice was tender, about 30 minutes. I put the soup in the slow cooker to keep warm for serving. This was a big hit and I was surprised how many people chose it. 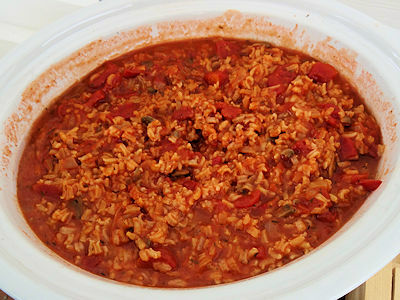 The rice gives it a hearty rich texture. The tomatoes have a bright taste and the broth was rich enough to come through. Even us meat eaters would like this soup! Put onions, garlic, celery, thyme, rosemary and oregano in a slow cooker. Put just enough water to cover the vegetables in the slow cooker. Cook on low for 18 hours. Strain the broth off the vegetables and discard the vegetables. Heat the oil in a large pot over medium heat. Sauté the onion for about 5 minutes, just until starting to colour. Add the mushrooms and sauté until a golden fond forms on the bottom of the pot, about 4 minutes. Add the rest of the ingredients and enough water to make 3 litres (quarts). Cook until the rice is tender, about 30 minutes. Now this is a vegetarian soup that I would gladly have a bowl of! Yum. Bring on a side of grilled cheese!